This week, April 23-29th 2017, is Preservation Week, a week set aside by the American Library Association to highlight the importance of conserving and properly caring for books, papers and other media, in both institutional and personal collections. 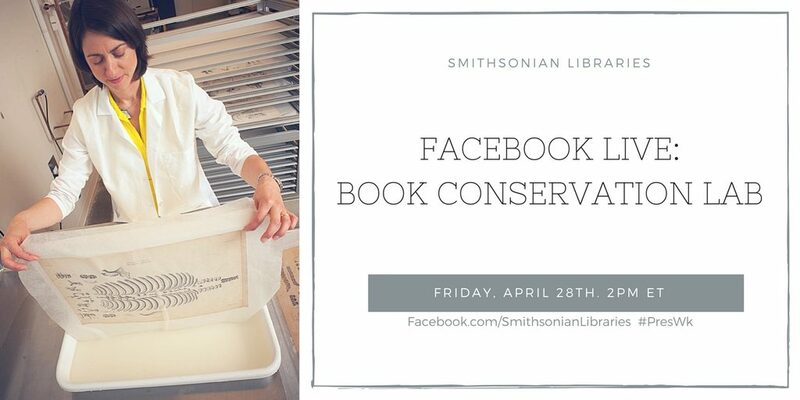 This year, we’re celebrating Preservation Week with a live, behind-the-scenes tour of our Book Conservation Lab, via Facebook Live. Viewers will have a chance to meet our conservation staff, learn about what they do and the tools they use and to ask questions about book and paper conservation. Tune in Friday, April 28th, 2017 at 2:00 pm ET on our Facebook page, to see what goes on behind-the-scenes to care for the over 2 million items in our collections. To learn more about Preservation Week and find helpful links for caring for your own collections, view our previous blog post on the topic.